No matter what you call it, I have always loved stained glass. When Hannah was born, Andrew presented me with a little Tiffany-style table lamp. It’s a beautiful thing, even if it doesn’t give off much in the way of light. 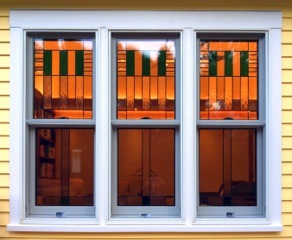 And a few years ago, we splurged on art glass inserts from Andersen for two casement windows we added to our study. Andersen did not have many designs to choose from and the inserts were wildly expensive, but we assumed that commissioning the work would cost even more. This year we made extensive modifications to our family room, including moving the door to the deck, adding three windows, and rebuilding the deck. Andrew redesigned the interior to include built-in bookcases and a stone surround for a new gas fireplace. We fantasized about adding art glass to the new windows, but discovered that Andersen didn’t make inserts for the double-hung windows we had ordered. And thank goodness for that, because then we met Roger Graf, the owner of Winchester Stained Glass. Roger has a little shop, tucked away down an alley in the center of Winchester, MA. The shop sells small pieces that you can hang by a filament attached to a suction cup and an assortment of glass jewelry, but the real business is the work Roger does in the back of his shop. He repairs original stained glass art, matches existing pieces, and works on commissions. He’s a friendly man, always happy to have visitors to the shop, never seeming to mind the interruptions to his work. He will gladly take the time to discuss a project, even if you’re still at the stage where you’re simply speculating about the viability of it all. When we met Roger, Andrew had already come up with several possible designs. The two of them discussed the design options and when they settled on one of Andrew’s designs, Roger took over. There are several types of glass in each window; colored glass is used sparingly; smaller pieces are beveled; alternating vertical bars are dense and corded; and the larger expanses have a subtle texture that makes you think you’re looking through water. Roger is such an artist that he cut the glass to fit around the hardware on the sash, and he installed the windows using cut-to-size horseshoe nails that blend into the came on the perimeter. His attention to detail spilled over into his billing practices as well; he is a scrupulously honest person. If you’ve always wanted stained glass windows, but thought you couldn’t afford them, you should talk to Roger. And if you want to see his work and I’m not home, you can always skulk around my back deck and admire the windows from the outside. 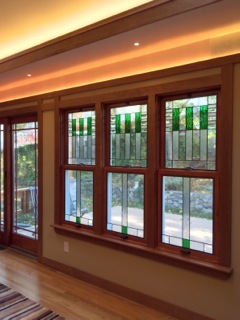 This entry was posted in Uncategorized and tagged Andersen windows, art glass, Stained glass, Winchester Stained Glass. Bookmark the permalink. That’s pretty awesome! Also, Andrew’s design! Solar panels AND art glass windows?! I’m drooling. You should be careful what you offer, Lord knows who you may discover skulking. Seriously, though, they are beautiful! Beautiful. I love the way everything turned out. Looks fantastic. Thanks for the pics. Kudos to Andrew!! Judy, absolutely GORGEOUS–I’m green with envy. Can’t wait to visit and stand out back and look at you all to see what you look like green and distorted. Windows look gorgeous! Yeah, for those of us who live too far away to skulk, could you post pix from outside so we can see what the view looks like? I’ll find some and send them.